A ten mile self-guided canoe trip through the Redwoods with return shuttle included. Picnic, swim, sunbath at beaches along this magnificent stretch of the river. View wildlife such as: otter, Great Blue Heron, osprey, turtles, and more. Canoeing at Burke's - a Russian River Tradition. Riverside camping & kayaks also available. Sonoma County's Best Eco-Adventure!! We offer two different length trips on the primo remote, “south of Healdsburg” run. This section of the Russian River has the most water in the dry summer months, so you will never drag your canoe over the shallows. The water is clean and refreshing for summertime fun, and there are many wonderful beaches for picnicking, swimming and sunning. Enjoy the comfort, stability and quietness of our SOAR Inflatable canoes...simply the best on the river. Because there are no houses or roads nearby, the bird and wildlife is amazing. This is a perfect trip for families, couples, and corporate outings. Our full day trips are dog-friendly. The staff at RRA is people-friendly! We have the highest ratings from customers on Yelp and Trip Advisor. Join us for a day on the river and see why! 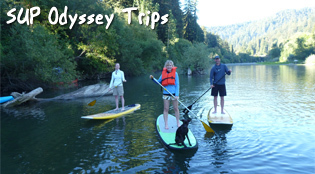 Guided 2 hour stand up paddle board (SUP) trips along the beautiful Russian River. Also we teach introduction to SUP and SUP yoga on our private lake located within a habitat preserve surrounded by organic vineyards in Sebastopol. Friendly water dogs are welcome! Now offering paddle board rentals! California's premier leisure canoeing destination. Just north of San Francisco. The river is slow-moving and safe during the canoeing season. If coming with children try to plan your trip in the mid-May through mid-September period. The shoulder periods of the season are excellent for the outdoor adventurers. During the winter the river rises, increases flow and hides branches and other snares. We do not advise canoeing the river during the winter unless you are experienced. We recommend you to the Bodega Bay surfing page which has information on surf conditions and the phone numbers of businesses on the coast. Here are a two of the most popular ways to travel the river. 1) Tour/Rental Operator Shuttle: For a fee a tour operator will drop you off and pick you up. Some companies run buses all day (for the river only), others have you call them of schedule a pickup time. 2) The Two Car Relay: Drive with someone to the pickup point, have them leave their car there and travel with you to the drop off point.